For the entirety of the Israeli-Palestinian peace process, Jerusalem has been set aside for after final status negotiations. The future of the city remains one of the stickiest of negotiating issues, alongside refugees. But setting aside a decision on a divided city, or an eternally unified one, is predicated on the idea that the city will, somehow, remain static. It has not. Indeed it is constantly morphing, and there are several challenges to a shared future. The map of Jerusalem itself has not remained constant since the city was unified in 1967. Jewish settlements at the edges of the city have metastasized, changing the map of both the city itself, and the potential outlines of a future two state solution—a Jewish state along side a Palestinian state, each with a shared half of Jerusalem as its own capitol. Twenty-three thousand new building tenders in the contested neighborhoods of Jerusalem were issued in the last year alone, more than the last three years combined. One man—Daniel Seidmann—an attorney, and the director of an NGO called Terrestrial Jerusalem monitors the map to make sure that it will still be possible to create two states with contiguous geographic elements. via Jerusalem, Divided and United | Pulitzer Center. NEW YORK, United States, June 25 (UNHCR) – A new travelling exhibition of photographs featured in a flagship UNHCR publication about refugees around the world has opened to the public at the United Nations building in New York. The exhibit consists of 26 enlarged photos from “The State of the World’s Refugees 2012,” which was launched in New York on May 31 by UN High Commissioner for Refugees António Guterres. The book, which is published every few years, explores key trends in forced displacement from 2006 to 2011. It also looks at the situation of stateless people. The photos on display show the lives of the displaced as well as the vital and life-saving work that UNHCR conducts in the field. The exhibition, which opened last week in the UN Headquarters Visitors’ Lobby, also includes videos depicting the stories of people who are either refugees, forcibly displaced within their own country, or stateless. The powerful images were taken by professional photographers as well as by UNHCR field staff. They show people in rural camp settings and urban areas and depict the humanity and resilience of people forced from their homes. The photographs include the cover image from the book, a striking aerial shot of makeshift shelters on the edge of Dadaab, the world’s largest refugee complex with almost half-a-million Somali refugees. The homes look like mushrooms sprouting out of the arid red soil. Another stunning image from the Horn of Africa, by Nansen Refugee Award laureate Alixandra Fazzina, shows a line of desperate people wading out to a boat off the coast of northern Somalia, hoping for a safe passage across the dangerous Gulf of Aden to Yemen. Only 11 people survived the journey. A photo from Greece shows young migrants and asylum seekers looking out through the barred gate of a detention centre on the island of Lesvos. In the western Kyrgyzstan town of Osh, a woman stands in the shell of the home she was forced to flee to escape inter-ethnic violence in 2010. She has a look of sadness and resignation on her face. 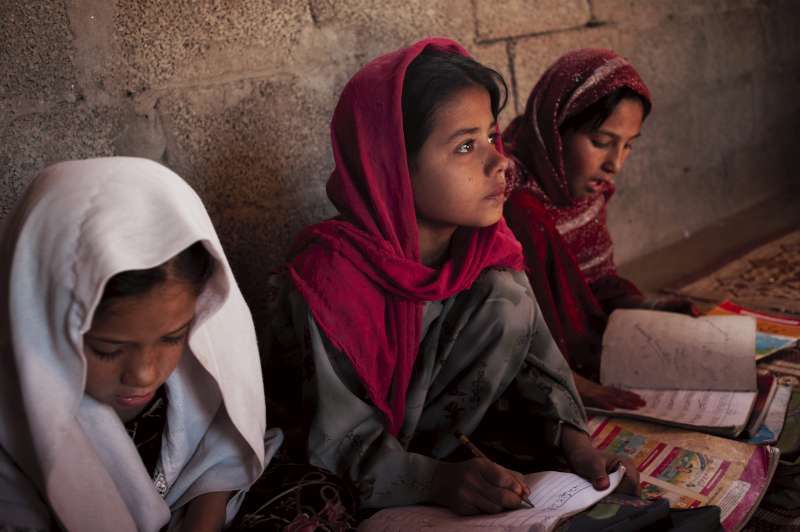 A photo from a refugee camp in Pakistan highlights the importance of education; it shows three young Afghan girls attending a class in school, which might be difficult in some conservative areas of their homeland. The exhibition also looks at UNHCR’s mandate to help the estimated 12 million stateless people in the world. An atmospheric portrait by professional photographer Greg Constantine shows a Crimean woman who was deported to Uzbekistan in 1944. In 1997, she returned to Ukraine and eventually acquired citizenship there. The exhibition will run until August 7 and is expected to be shown in other cities around the world, including later this year in Geneva to coincide with an annual dialogue chaired by High Commissioner Guterres between UNHCR and its partners. All of these men, women, and children left likenesses and traces of their journeys to America’s entry ways. Entering, leaving, or staying in America—their stories were captured in documents and photographs that were “attached” to government forms. A new National Archives exhibition, Attachments: Faces and Stories from America’s Gates draws from the millions of immigration case files in the Archives to tell a few of these stories from the 1880s through World War II. It also explores the attachment of immigrants to family and community, and the attachment of government organizations to laws that reflected certain beliefs about immigrants and citizenship. These are dramatic tales of joy and disappointment, opportunity and discrimination, deceit and honesty. Attachments: Faces and Stories from America’s Gates is free and open to the public, and will be on display in the Lawrence F. O’Brien Gallery of the National Archives Building in Washington, DC, through September 4, 2012.